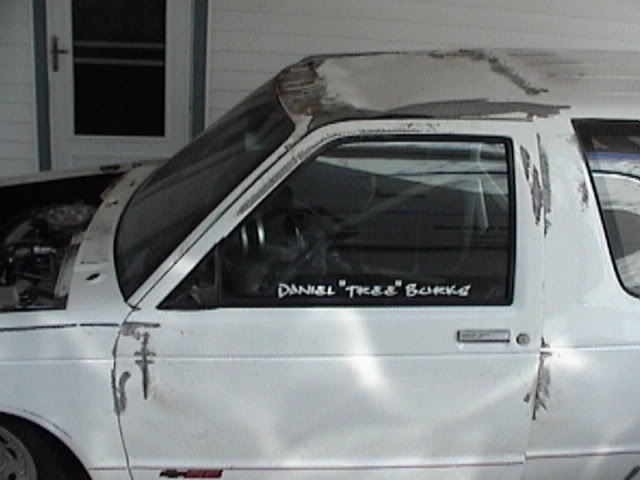 Before Daniel bought his current blazer he had an 86 S-10 with a 355 and nitrous that would run 9.90s in the 1/4 on pump gas all day long and dead hook on the street. He used to do a lot of street racing back then and when the laws in Texas started getting more strict Daniel turned to racing at the track. 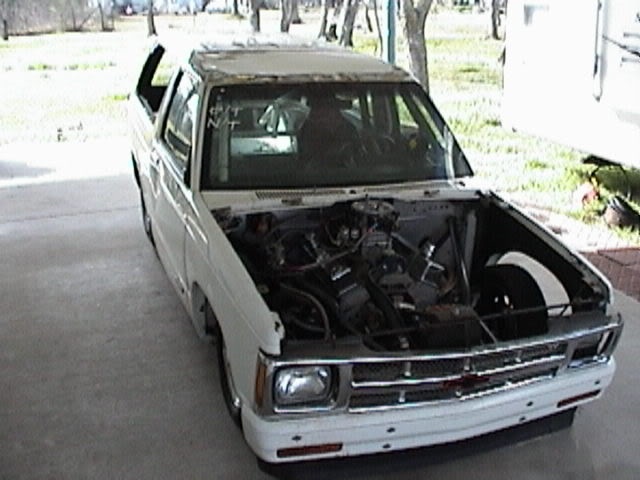 After running at the track for a couple of years with the S-10 and getting into the grudge scene a little he found out that his little S-10 wasn’t as unique at the strip. When he would approach someone and try to get a race they would ask what kind of vehicle he had and he would respond with an S-10, they would ask “which one?”. Along with racing his own S10 at the track, a friend of his hired him to race his Blazer. 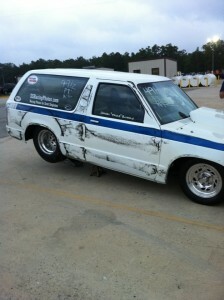 Whenever he would show up to the track to race the Blazer, it was obvious that it stood out at the track. 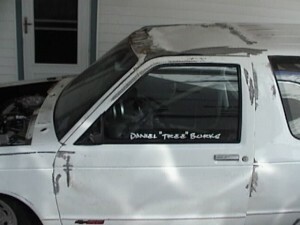 This was the uniqueness that Daniel was looking for so he decided to sell the S-10 and buy the Blazer. When he bought it in 2005 as a rolling chassis it was 70% completed but the motor was in pieces. He had to finish the wiring and do some other little things to the truck so it would live up to his standards. He put the motor back together and started racing it in the same class he had run it in before being the owner. But now he could decide what kind of power adders he wanted to put in it. After getting bored with running high 9s he decided to put a nitrous kit on it and started with a 100 shot plate system. He went to the track with the plate system on a button and realized real quick that it liked to try and bend the wheelie bars when you sprayed it off the trans-brake. It had some short wheelie bars on it and would either turn right or left on the launch depending on which wheelie bar hit first. He could make one decent pass out of every 4 passes, all the others he would have to abort. One night at the local Baytown track he was making a 1/4 mile hit and at about 800ft mark, the run went south and the sound of big side wall tires sliding sideways will be burned into his memory forever. 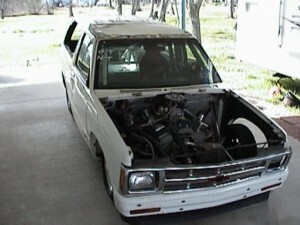 Daniel had built the Blazer with the radiator laid flat under the fuel cell. When installing it he was in a hurry and didn’t buy the correct length hose when extending it from the previous owners #6 cooling line (He’s not sure who thought that would be enough to cool it but never-the-less that was what the truck had.). So he used two short radiator hoses and coupled them with a piece of PVC pipe. Not realizing that when PVC gets hot (around 170 degrees) it gets spongy. So when the truck got hot, the clamps on the hose became loose allowing one side of the hose to blow off dumping water all over the track. After using both lanes of some back and forth action the steering linkage broke sending him over onto the roof sliding through the 1/4 mile traps on his lid. The whole time he was sliding, the sparks where flying and as he looked out of his passenger window he could see his nitrous bottle still attached to the feed line spinning on the ground right outside of his door. Again, he had been in such a rush that he didn’t bolt the bottle brackets to the truck but instead wedged the bottle between the passenger seat and wheel tub. After coming to a stop still upside down he took his helmet off so he could get a better look at what had just happened and how bad the damage really was. He then performed the whole “nut check” maneuver just to insure everything on him was still where it belonged. This is one crash he would be able to walk away from. As he walked towards the ambulance he could hear glass hit the ground as they rolled the blazer back onto the wheels. After taking a couple months off to assess the damage he began to cut the roof off and replace it himself. After making other repairs he went back to the track and got the blazer back to the way it used to be within a couple of passes. He ran it primer white for a couple years and during all of the Pinks All Out episodes he had come to realize that perhaps it was time to make the Blazer look as good as it ran. He got in contact with First Collision in Baytown and they hooked him up with a killer pearl paint job that you see on it today. There was a two week window between the San Antonio and Shreveport Pinks. He dropped the truck off right after one and picked it up Wednesday before leaving on Thursday to the other. He raced it at the Pinks in Shreveport and entered into the wheelie competition. They were running it in the right lane but there was a mustang in front of him that tried to take the tree out so they moved him to the left lane as he pulled up. When he let go of the trans-brake button the truck carried the tires about 80 feet but when it came down from 4 foot in the air the right coil-over bracket snapped causing the front wheel to go into the wheel well and the right rear to come off the ground shooting him hard towards the right wall. He was able to get it straightened back up about a foot from the wall saving the three day old paint job. This can be seen in the opening credits of Pinks All Out season one and two. After a couple more years of different kinds of racing he started getting into the grudge racing scene more. Daniel kept adding power with a bigger USA Engines built small block and another nitrous kit. He also decided to take the 33 rear tires off and put on some true 10’s. On the first trip to the track with the true 10’s he let go of the trans-brake and the truck took off only to soon be in that dreaded side to side action as if the slicks were skating on top of the water again. This time he only rolled it onto the side. The truck wasn’t hurt as bad this time so he dropped it off at First Collision the very next day and they repaired and re-painted the truck for him. The experience of running a vehicle like the blazer that is top heavy at 160-170mph is what makes it fun for Daniel. You actually have to drive the truck since it will start moving around at those kind of speeds, keeping you on your toes. 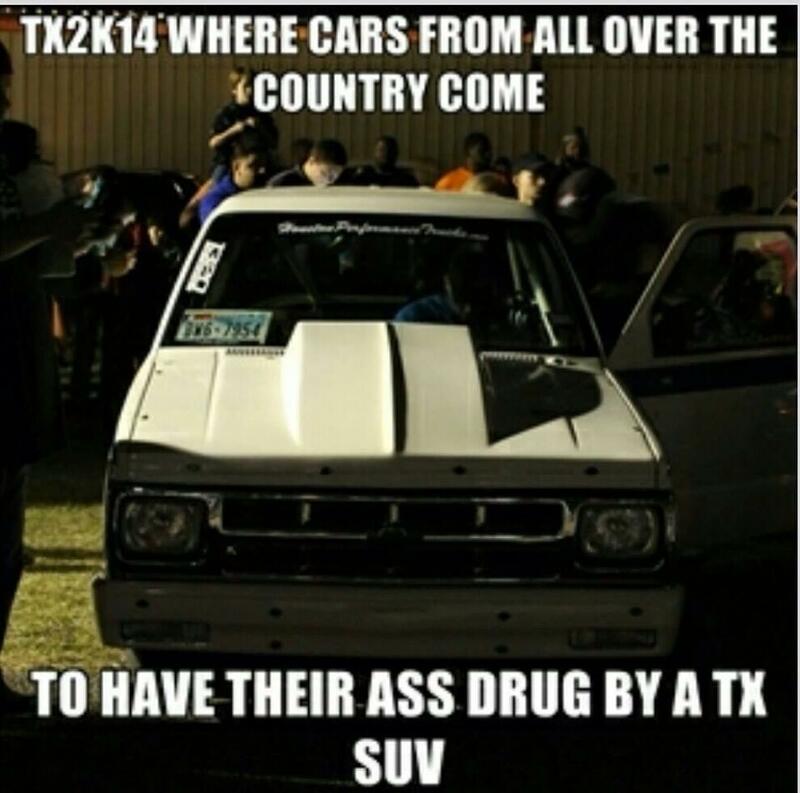 Daniel told me about an event in Texas that he competed in called TX2K14. 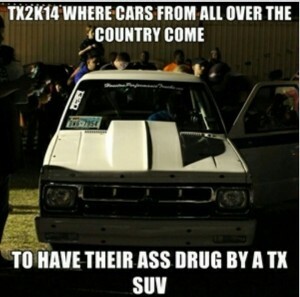 Vehicles from all over the country come to compete. It was an event that was held at a local airport on a no prep track and this little SUV held it’s own. Who says Blazers aren’t fast? Good Job Daniel! We are proud to have you as a part of our V8 S Series family. His current setup is a 421 SBC Dart pro 1 215 runners, HVH port matched intake with 2 kits, PRC 1050 dominator, bullet .700 lift 4/7 swap cam, eagle rotating assembly with Custom JE pistons in a dart block. Power glide transmission and 9in rear. He plans to make it a little faster and eventually redo the chassis with chromoly making it lighter and stronger.